Back in February, 2010, we attended a talk by filmmaker Arthur Dong at the South Pasadena Public Library prior to our film screening at UC Irvine. Following Arthur’s showing of Hollywood Chinese, we spoke with several of the organizers, including City Librarian Steve Fjeldsted, about bringing Autumn Gem to South Pasadena. We gave him a DVD and communicated with him over the next several months, ultimately setting up the screening we held on October 21, 2010. First of all, big shout of goes to Steve, members of the South Pasadena Chinese-American Club and the Friends of the South Pasadena Public Library, for bringing out over a hundred people! It’s always great to have large crowds come out to our screening, and it’s a bonus when they all stay to the end for the Q&A. We made some contacts as well, so there’s a good chance we’ll be coming back in 2011 for additional SoCal screenings. One audience member suggested comparing Qiu Jin with Jiang Qing and her powerful influence as Mao Zedong’s wife. Interestingly, a few weeks ago Rae happened to see a documentary about the “Eight Model Works” (CCP propaganda films made during the 1960’s), which was told from Jiang Qing’s point of view. She wielded tremendous power as the mastermind behind these productions, as they were the only forms of public art allowed at the time. As another controversial female political figure in modern China, she certainly raised a lot of lively discussion amongst the audience members! We’ve been getting good compliments on our poster for Autumn Gem and have been fielding inquiries on whether or not they could purchase the poster. Well, ask no more, because we have the 16×20 Autumn Gem poster available for printing from SmugMug. 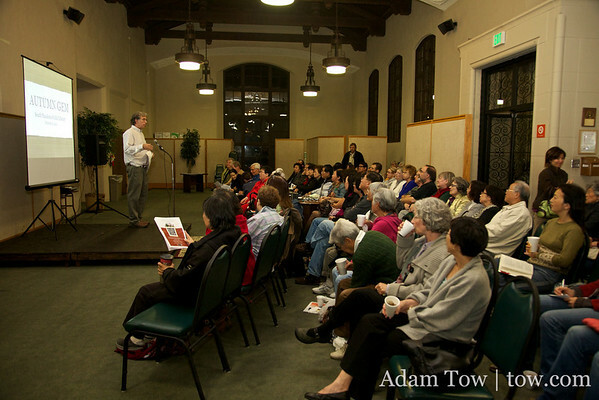 Here are photos from the South Pasadena Public Library screening.